“Ha, ha.” As far as epigraphs go, these two interjectory words from the book of Job do as good a job as any at describing the book’s content: humorous, yet poignant. At first, I was laughing along at reading about the life of a seemingly obsessive Manhattan dentist: taping every Red Sox game for 30 years; ruminating about being an outsider to the clique of hand lotion users; upset at not knowing the celebrities on a tabloid’s front cover—but then I realized it. This dentist could be any one of us. 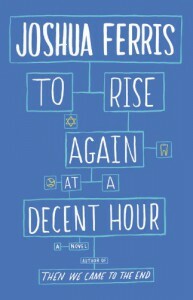 RISING AGAIN AT A DECENT HOUR is a marvelous exploration of everything we are. O’Rourke’s life comes alive through Ferris’s skilled writing. For instance, when he wants to describe his poor upbringing, he doesn’t just say he had a poor upbringing; he says, “There were no poorly attended funerals in the Santacroce family, no scrounging for quarters under the car seats, non runs to the recycling center for macaroni money, no state-appointed psychologists; no suicides.” So much more is offered thanks to his lively descriptions. You’ll also be treated to some new terminologies (which I may have to borrow, too), such as the “me-machine”, the “thunderbox”, and being “c**t gripped” (as opposed to being “p***y whipped”). This book is funny, yes, but so much, much more. You’ll sit beside O’Rourke as he watches people in the mall, and you’ll nod your head in agreement. When he upgrades his equipment in his office, you’ll get the point when he says “so that we could do everything electronically better than we could do it electronically before.” And when his e-mail tormentor replies to him, “what do you really know of your life?”, you’ll pause your reading, set the book in your lap, and think about what you really know of your life. And if anything else, you’ll want to floss more. Thank you Little, Brown and Company for sending this book to me for review: I really loved this book.